Although South Carolina’s Slow Runner evokes a certain complacent lethargy in its moniker, for members Michael Flynn and Josh Kaler, this year has been anything but slow. and a week later, the group hit the road with William Fitzsimmons, in whose company they spent the majority of 2011. 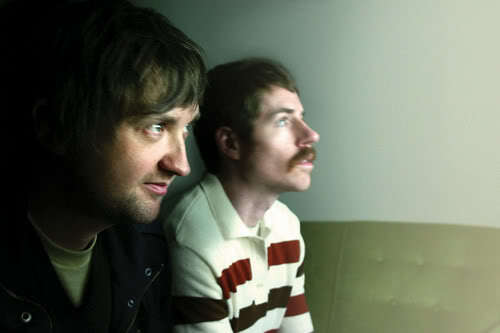 The Fitzsimmons connection came about as the result of having the same managers in the past; the two acts first toured together in 2008 when Fitzsimmons’ album, “The Sparrow and the Crow,” came out, which coincided with Slow Runner’s third album “Mermaids.” Both put out albums this year, and so touring together once again made sense. What began at a 10-week journey across the United States and a summer stint in Europe is now being rounded out with a fall/winter leg in Europe, the final date of which is tonight. And although the band has been to its fair share of countries, Flynn admitted that Germany is the country which he most enjoys. Of course, because much of the year since the release of the album has been spent on the road promoting it live, Flynn admitted that he and Kaler haven’t spent too much time writing new songs. In the past, Flynn has been the primary songwriter, first making demos and then giving them to Kaler to help flesh out. However, although the arrangements have always been collaborative, “It’s Back” (track 4 on “Damage Points”) was the first song the two have actually co-written. Still, both Flynn and Kaler are proud of it. Whereas “Shiv!” was louder than the debut (“No Disassemble”) and “Mermaids” was more somber, the two view “Damage Points” as a sequel of sorts to the first full-length. In spite of all they’ve learned in the eight years of playing together, Flynn did admit that he’s never quite satisfied with how the records turn out, which is probably a good thing, because it gives him something to keep striving for. Once Slow Runner returns to the U.S., the next task will be discovering what direction the band’s sound will take Flynn and Kaler in, something which even the two of them don’t know. But ultimately, the future isn’t as important to Slow Runner as right now is; the members are taking their time breathing in the sights and sounds of the present. Slow Runner plays the second of two shows supporting William Fitzsimmons tonight at Heimathafen Neukölln in Berlin. The show begins at 21.00. This entry was posted in Interview and tagged American, Feature, Interview, Slow Runner. Bookmark the permalink.